West Rudham, from the Old English meaning ’homestead or farm of a man named Rudda’, is a large parish in the northwest of the county. The history of the parish is closely entwined with that of the neighbouring East Rudham. East and West Rudham lie close to the source of the River Wensum, and the villages are strung out along a common. The Neolithic long barrow (NHER 3611) at West Rudham is only of only five examples in the county, and is the best preserved. The barrow was excavated in the 1930s, which revealed how the barrow was constructed. A number of Neolithic flint implements have been found, including Neolithic axeheads (NHER 3613, 3614, 3615, 3616, 3618, 3619, 3620, 3640, 15729), a Neolithic chisel (NHER 3617), a scraper (NHER 14015) and Neolithic arrowheads (NHER 12661, 14850). A number of Bronze Age barrows (NHER 3625, 3624, 3626, 3627, 3628, 3649, 11287) are strung out along West Rudham Common, whilst another is visible as a cropmark on aerial photographs (NHER 16874). Bronze Age pottery fragments (NHER 3649) were found on the site of one of these barrows (NHER 3649) in the 1930s. Rudham seems to have been a place of some significance from the Iron Age onwards. Iron Age coins, brooches, a terret and other metalwork (NHER 28131, 30441, 30842) have been found, and other Iron Age coins (NHER 30883, 34265) have been found in East Rudham. However, no Iron Age settlement has been definitely located in either parish. There is a substantial amount of evidence for Roman settlement in both East and West Rudham, along the course of a possible Roman road. The site of a possible Roman building (NHER 30883) has been discovered close to the course of this road and a large amount of Roman brick and tile, as well as a fragment of window glass, have been found on the site, as well Roman metalwork including coins and brooches (NHER 30883). Large amount of Roman coins, brooches, tiles, pottery and other Roman metalwork (NHER 28130, 28131, 30441, 30842) have been recovered from the village of West Rudham, suggesting that Roman settlement was focused in that area. 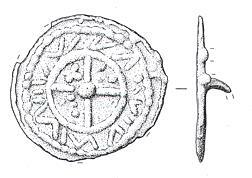 Saxon metalwork found in East and West Rudham suggests that it was an important Middle Saxon market or ‘productive site’, and a possible estate centre. 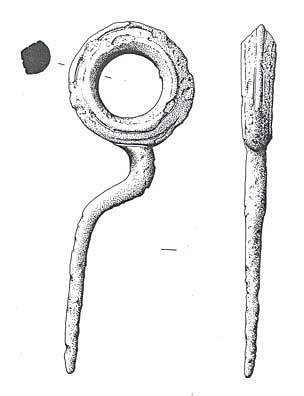 In West Rudham, Early and Middle Saxon pottery and metalwork (NHER 28130, 28131, 30441, 30611) have been recovered from the area around the village green, including a silver Middle Saxon ear scoop (NHER 28131), a Middle Saxon pin with an unusual cross shaped head (NHER 28130), and a Late Saxon plaited gold ring (NHER 24972). 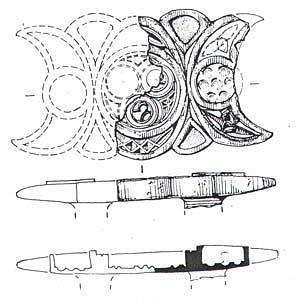 A very important example of a 9th century Carolingian strap distributor (NHER 32133), which was probably imported in the Saxon period, has also been found by metal detecting in the parish. 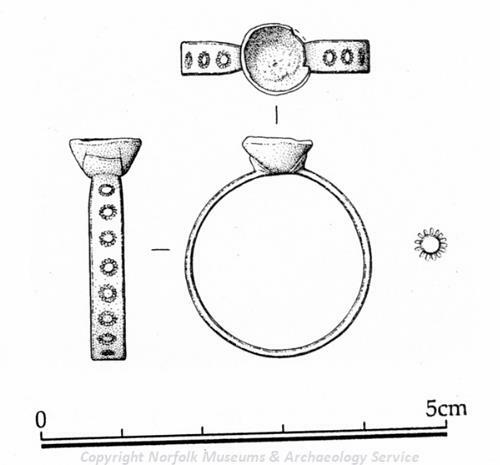 A number of Early Saxon brooches and other metalwork have been found on one site, suggesting that it is the site of an Early Saxon inhumation cemetery (NHER 30441). In Domesday Book, East and West Rudham are treated as one settlement, with two churches, a number of ‘outliers’, including settlements at Bagthorpe, Houghton and Barmer, which suggests a fairly substantial settlement, perhaps a former estate centre. St Peter’s Church (NHER 3646) contains a Late Saxon or Norman blocked window, which suggests that it is probably on the site of an earlier church building. The church dates mainly from between the 13th and 15th centuries, with 19th century restoration. A medieval moated site (NHER 3647) has survived as a large earthwork on the village green, and medieval pottery has been found on the site. Meadow Cottage (NHER 30616) is built on the site of a medieval house, which encroached onto the medieval common. The remains of a medieval fireplace have been found inside the house. A medieval coin hoard of over three hundred coins (NHER 30611) has been found, as well as other medieval and post medieval pottery, coins and metalwork (NHER 28130, 28131, 32898, 41921 etc). The Duke’s Head public house (NHER 13303), The Grove (NHER 13304) and Hall Farm (NHER 13305) are all 17th century buildings, whilst Rudham Grange (NHER 34748) dates from the early 18th century, with substantial 19th century alterations, when the Grange was acquired by the Raynham Estate. The 19th century barn (NHER 34748) on the farm is one of the largest in Norfolk, with four threshing floors. During World War One a military airfield (NHER 13630) was constructed in the parish, but its exact location is unknown.